Star Painting LLC offers professional commercial painting services for businesses in Keizer, Oregon and the greater Willamette Valley. 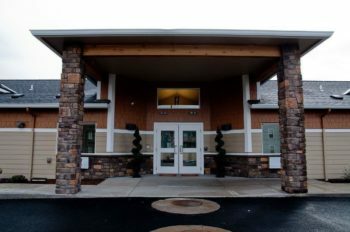 Our team of dedicated, commercial painters serving Keizer have been delivering quality interior paint and exterior paint services for over ten years and has a proven record of raising the bar on service and technique. As a division of Star Builders, an award-winning general contractor service in Keizer, Star Painting keeps its standards high. We offer commercial painting services in Keizer for small and large businesses alike and customize our services based on client needs. Need color matching services? We offer specialty accent colors as well as spot-on paint color matching for building renovations or additions. Our paints are sourced from Sherwin-Wiliams and Oregon’s own Rodda Paint. Two companies offering high-quality paints that are proven to stand the test of time. Not only do you have a wide range of colors to choose from, your topcoat choices come in a variety of finishes. Our team will help you decide which is best for each environment. Large-scale painting has a large-scale impact. That’s why Star Painting provides commercial customers with as much information as possible so they can make informed decisions before the brush even touches the paint. With every commercial project, we always start by pre-planning, evaluating safety requirements, and determining timelines. We strongly believe that good information, communication, product knowledge and clear pricing always set the job up for success. So, if you have any questions along the way, we’re available to answer them. What do I need to know before hiring Star Painting to paint my building or complex? Painting can be done independent of construction, as part of a renovation or tenant improvement project for light commercial facilities, apartment buildings, and assisted living communities. All surfaces are inspected, cleaned, repaired, primered, and prepped as needed before our painters get started. The owner or designer provides specifications for paint coatings. All paint, coatings, primers, equipment, and application methods are OSHA approved. Surface preparation means previous coatings and mildew may be removed, drywall may be touched up, repaired areas will be primered, and overspray protection will be applied. We paint under fixtures, doorknobs, and panels – not around them. Star Painting is lead-based paint certified. We provide safe, licensed lead paint removal for buildings older than 1979. Budget and scheduling standards are strictly followed. Change the face of your business with a company who has changed the face of commercial painting. 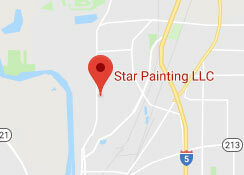 Contact Star Painting in Keizer, Oregon today. © 2019 Star Painting LLC. All Rights Reserved.